If you’re fastidious about keeping your windows tidy, Stay is for you. Stay ensures that your windows are always where you want them to be, even as you connect and disconnect displays. Move your windows to where you want them, then have Stay store them. Once stored, windows can be returned to their stored state at any time by having Stay restore them. Stay can store a set of windows for every combination of displays that you use with your computer. For example, if you have a laptop that is sometimes connected to an external monitor, you can store two sets of windows in Stay; one with the external monitor connected and one without. This done, you’ll be able to ensure that your windows are always where you want them to be by having Stay restore windows whenever you connect or disconnect the external monitor. Stay can even be configured to automatically restore windows as displays are connected and disconnected. • Improved compatibility with macOS 10.14 Mojave. Stay 1.2.8 requires a minimum of macOS 10.13.6. • Improved support for dark mode on macOS 10.14 Mojave. 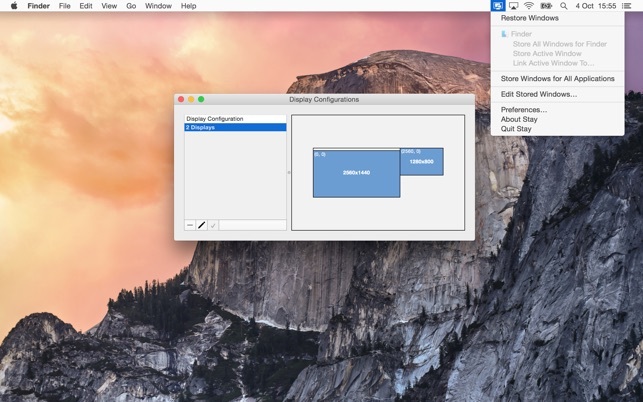 • Improved reliability when restoring windows for apps with a single window. • Fixed a bug that could cause the wrong display to be shown as the "main" display in the stored windows editor. * Fixed a bug causing Stay to crash if the active application had an empty name. • Fixed a bug that could cause "Store Windows for Application" to incorrectly store windows from the wrong application under certain circumstances. • Improved restore windows as applications are launched behaviour when running multiple copies of a single app. • If Stay is running with its menu icon hidden, reopening Stay from the Finder will show the menu icon temporarily and display the preferences window, making it easier to disable the "Hide menu icon" preference. 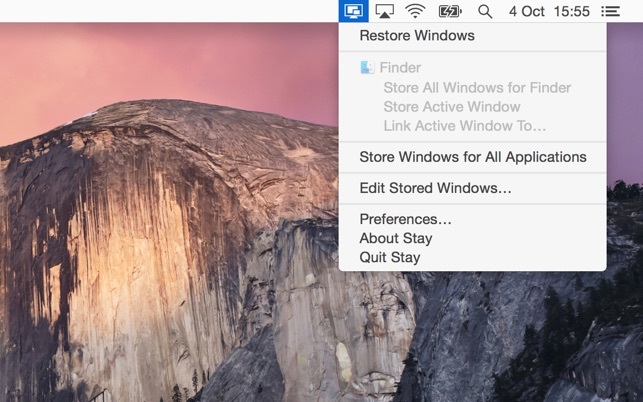 • Stay no longer gets stuck restoring windows if another app on the system is beachballing. This is a decent utility that makes my life easier as I swap my macbook pro amonst a variety of external displays (two Dell displays at work, occassional conference room display, iMac running in target mode at home). It gets me about 60-70% of the way there. However, it seems to be unable to restore window height when moving between different display sizes. Also, it doesn’t put all windows back in their proper location or in their Space (virtual desktop). I’m often having to move windows from the default Space to the correct one. Finally, applications which tend to have lots of windows (e.g., Safari) tend to not be restored correctly (both in terms of size and Space). This is better than nothing, but it could be a lot better. Awesome, does exactly what it claim. I use an external monitor both at work and at home. When I disconnect the monitor from work and connect my home monitor, all the windows were squeezed into one desktop. I tried pining the window to certain desktop using the OSX desktop feature(always open in certain desktop). It didn't work. This bothered me for quite a while until I found out this app. It works perfectly as expected. They also provide a 30 days trial period without a fee. Awesome app! This app purports to do exactly what I want. It just doesn’t do it well. It worked a little better when I first bought it but it only effectively saves some of my windows. It does help a little as I only have to reposition some windows on restart or disconnect. It really struggles with spaces and also when you have multiple windows for a single application. And where it tries to resolve those issues, it’s clunky to use as well. So it may be able to solve some of my issues, but the settings are not user friendly.